​Tomahawk and axe throwing is a fun and exciting recreational activity that almost anyone can enjoy. In order have the perfect throw, there are a few things you should know. This article will give you a step by step guide on exactly how you can achieve that. Before we get started, let's take a look at the things you need to enjoy this sport. For a video demonstration scroll to the bottom of this page. Choosing the the right size and length is very important because it greatly affects the speed and accuracy when throwing the hawk. The target can be made from log rounds or wood planks. Make a log target by cutting at least a 4 inch thick piece. After cutting, use a tripod design to prop the target up in a way that will allow for impact without the target falling over as shown above. Hold a tomahawk as you would hold a hammer. Grasp it near the bottom of the handle. Make sure that the head of the hawk is at the center from where you're gripping it. It shouldn't be tilted to either left or right side. To have a consistent throw, it's important that you also have a consistent grip. You can mark the handle to make sure that you're gripping from the same spot. Place one foot slightly forward. Assuming you’re right handed, then your right foot is forward. It is important that you are in a stable position because throwing the tomahawk might push you back. Evenly distribute your weight and don't spread your legs too far apart. Remember to relax your arms as tension in the arms can limit your accuracy and range of motion. * Take a look at the picture and observe how the big guy (not the little one!) is positioning himself and gripping the tomahawk. 1. Walk at least 5-6 paces away from the target then make a line in the ground. This distance will give the tomahawk one revolution till it reaches the target. 2. Do the right stance by positioning your feet in a pitcher's position with the foot opposite your throwing arm forward. 3. Grip the tomahawk properly by holding it by its bottom end, with the sharp end facing straightly outward. 4. Look closely at your target and focus on the spot that you want to hit. 5. 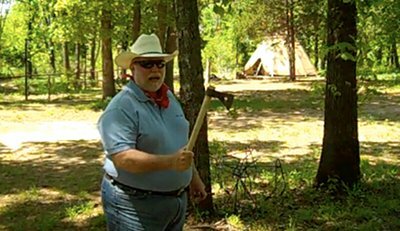 Lift the tomahawk slowly over your shoulder, and throw it straightforward towards your target. Can you find a bigger pic? So the hawk isn't sticking eh? Diagnosing your throw will help you achieve better success in sticking your tomahawk each time. The most common mistake is the distance to the target. Watch where your tomahawk is when it hits the target. Using the diagram to the left, identify if you are too close or too far away when you throw. Is the bottom of the handle hitting first? Then you are too close to the target - move back a foot. Is the top of the tomahawk hitting the target first? Then you're too far away - move one foot closer. Still don't get it? Check out this video of an actual tomahawk throw. ... and that's how it's done!